Blowouts are often boring for fans, yet this one provided some interesting new wrinkles to study. We also had some questions answered about the direction of countering defensive measures against the Zone Read, which some may find surprising. Finally, we began to see the opportunities created by opponents who commit the majority of their resources to stopping the Oregon running game. The result is a record setting day! 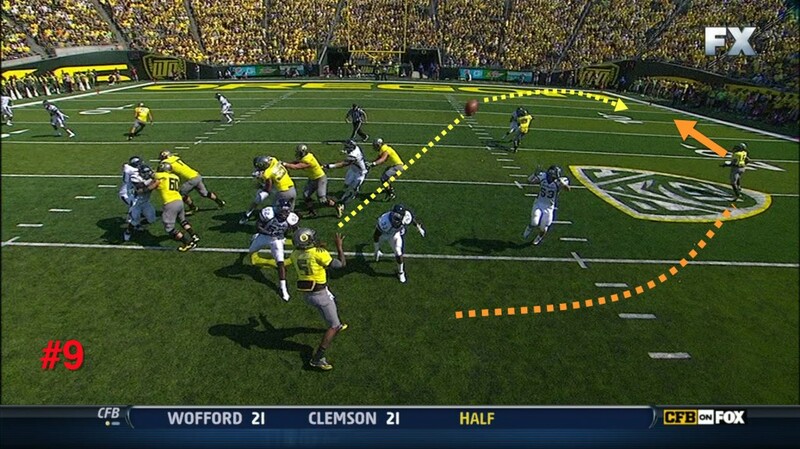 Many Oregon fans have been complaining about the lack of Zone Reading by Darron Thomas; that he has simply been handing off each time. Given the injury to Costa last year and how the ratio of QB runs had diminished after Nate went down—it is a fair question as this season begins. 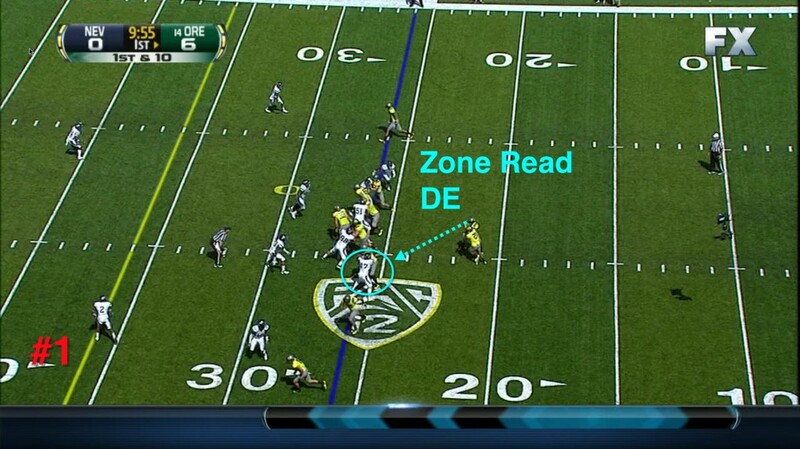 Note in the picture above how in the Nevada game we had the usual Zone Read of the Defensive End while running an Inside Zone Read. 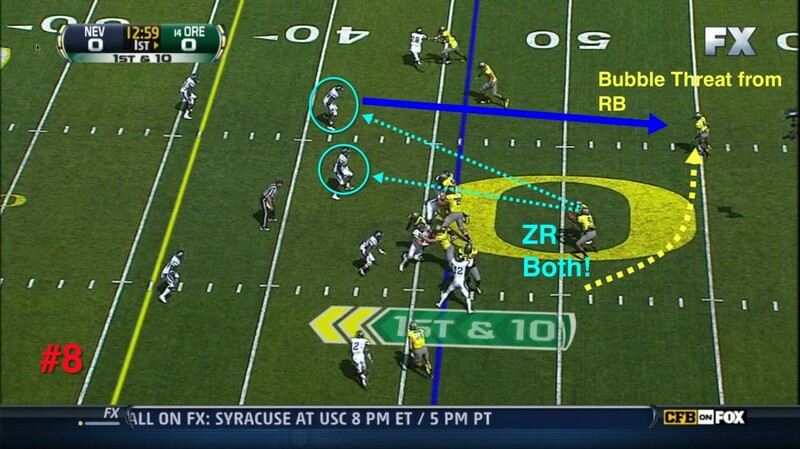 This is typical and expected, and for in depth questions about the Inside Zone Read—refer to last week’s Ducks Illustrated or go to FishDuck.com for a tutorial video. 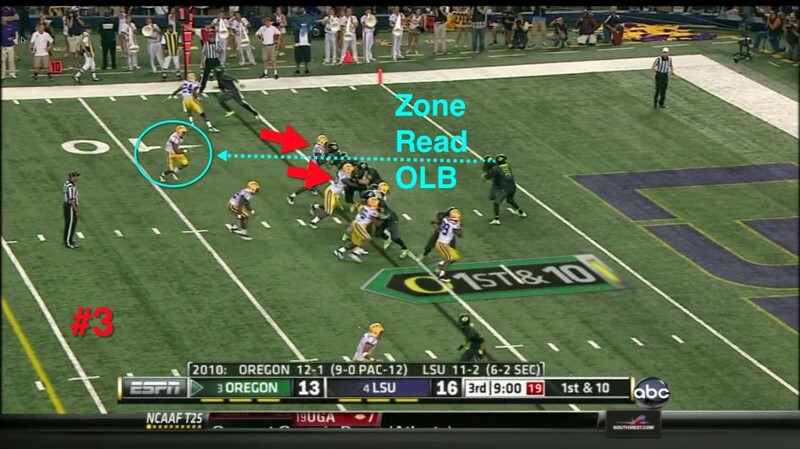 We heard rumblings that there was little Zone Reading done against LSU, yet here is an example (Above) of Zone Reading a Defensive End on a scoring drive in the second quarter. Now it gets interesting (above) as we see in the LSU game where the Tiger Defensive linemen (Red Arrows) are clearly being blocked, thus it does not appear that any of them are being Zone Read. Yet look at where Darron is watching and it is the Outside Linebacker! Since the OLB is “sitting” and removing that running lane for Darron, then Thomas hands off. Now we counter the charging of the Mesh point (as we saw in the NC game) by blocking the D-linemen, and Zone Reading the OLB! Without knowing this-it WOULD appear that Thomas isn’t Zone Reading anyone! This picture above from the Nevada game makes it very clear that the defensive linemen are being blocked and NOT Zone Read, (Red Arrows) while it is evident that Darron is looking right at the OLB for his cue. Since the OLB “sat” in the lane, Darron hands off. 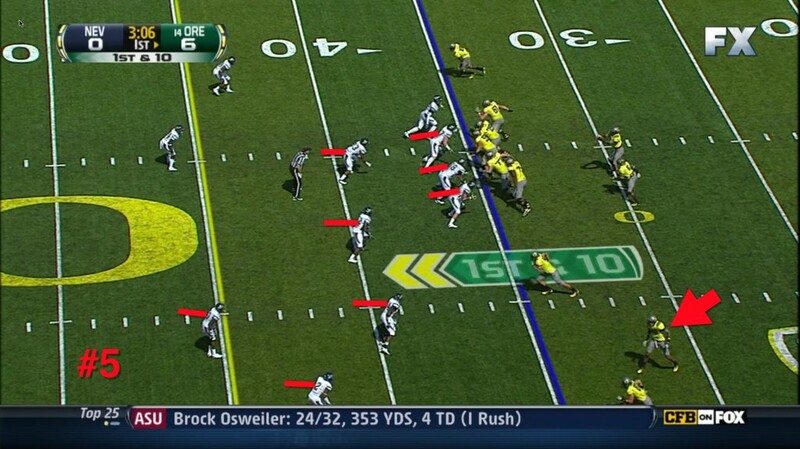 This is becoming Chip’s “Counter-to-their-Counter” as the Chess match of Xs and Os on the football field escalates. Nevada was being very clever with shifting their Defensive Linemen at the last moment into the hole we were attacking. This picture #5 above demonstrates how the Wolfpack defense was quite concerned about our Bubble Screen Pass Series (Red Arrow) and how it generates easy yardage for moving the chains. They shifted into a formation emphasis to their right as you see from all the red lines. As Darron is doing the mesh-we see how the Defensive backs are positioned below to blunt the Bubble Screen that is seemingly forming. Thomas is clearly Zone Reading the OLB who is sitting, thus Thomas should hand off because the extra Offensive lineman who is NOT blocking this Linebacker can now be used on the playside. The Wide Receiver at the top will run a route that will pull the defensive back inside, and with the wonderful blocks made on this Outside Zone Read at the top of the screen—DAT (DeAnthony Thomas) takes off for a sixty yard scamper. Nevada was worried about the Bubble threat and since they had just stuffed a bunch of Outside Zone Read plays—they were momentarily distracted toward the Bubble Screen Pass end of the field. That’s all it takes! The backfield alignment above in picture #7 is the routine twin backs formation for running the Oregon Straddled Triple Option. (See video Tutorial at FishDuck.com) Since it is a balanced formation it does not give away the direction of the play. 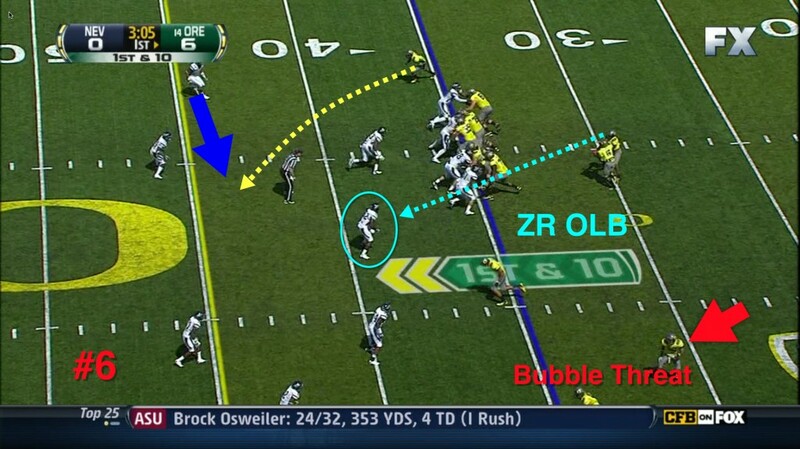 Just before the snap we see the left RB circle around to the right as if to take a Bubble pass? 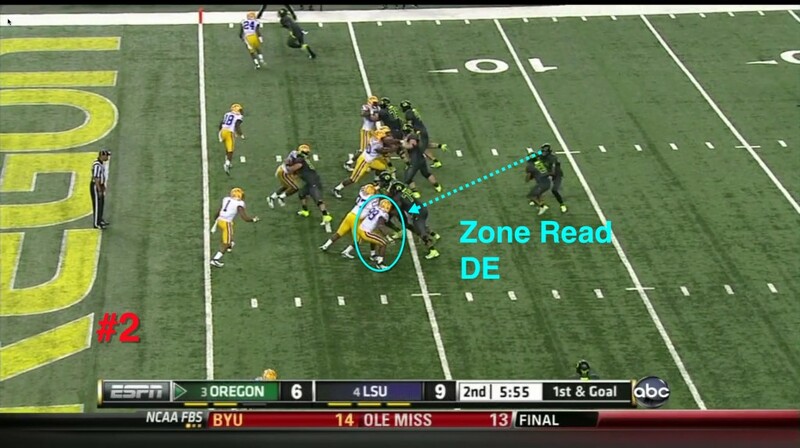 I wouldn’t have believed it if I did not have picture #8 above showing us how Darron Thomas is Zone Reading TWO players at once! 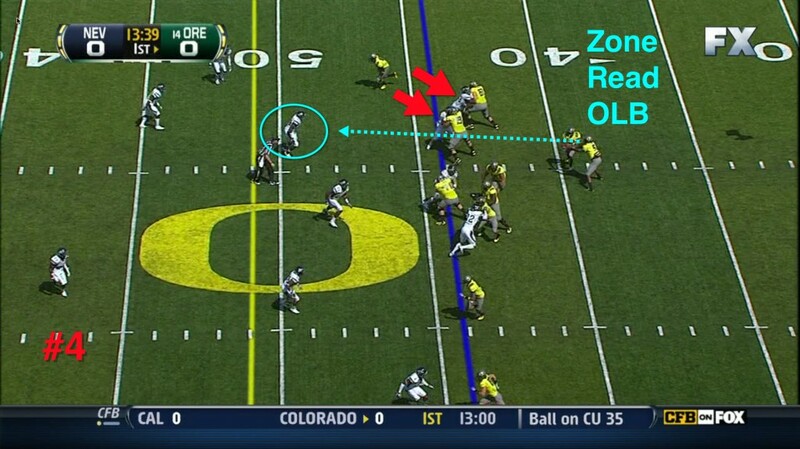 He is checking to see if a Defensive back is “sitting” to stop the Bubble Pass to the RB. 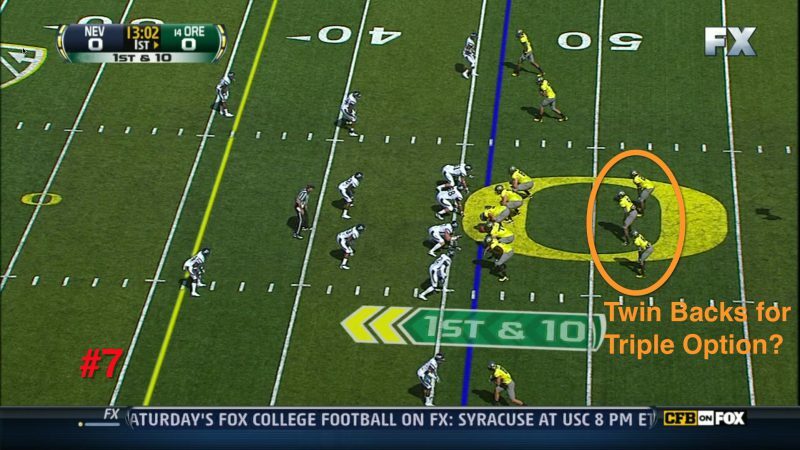 Darron is also Zone Reading the OLB to see if there is a lane for Thomas himself to run…and since the OLB is “sitting” then the correct read is to hand off since the defense is stretched to the top sideline to cover these two “options” of the Straddled Triple Option. Tra Carson is running the Inside Zone Read the other direction and powers his way for eight yards. What an interesting new variation off the Triple Option, and ANOTHER way to stretch the defense to open up the inside running game. It was a wonderful day to announce a nasty passing threat which will make opponents think twice about selling-out to stop our running attack. It was also essential for building confidence in a number of new players like DAT, Rahsaan Vaughn, and Colt Lyerla. It only gets better from here! At this time a year ago- Vaughn and DAT would have been watching DJ Davis and Jeff Maehl doing the victory jump on television. 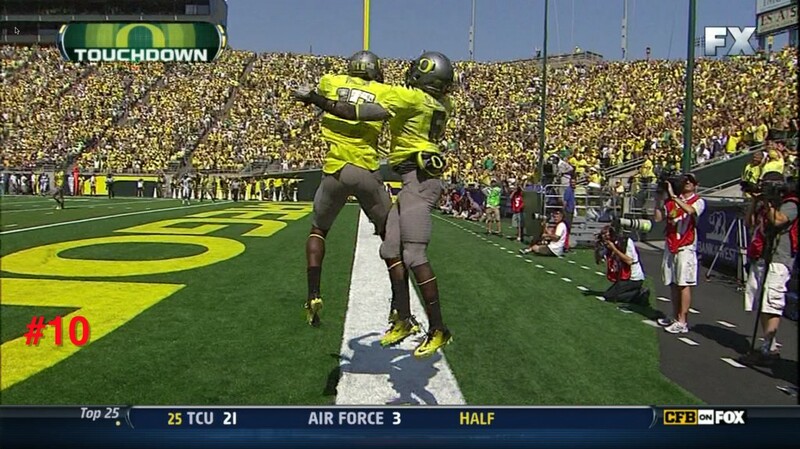 Now it is THEM, the new generation of players who will hear the roar of the Autzen Stadium crowd as they celebrate so many more times this season. The Best is Yet to Be with these two!